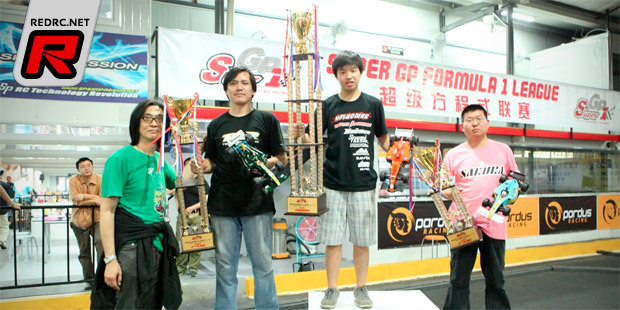 The Super Grand Prix One (SGP1) F1 RC league concluded its first inaugural season in China with great success. Over the course of 6 months with 6 rounds of intense racing, the final round saw 3 drivers with the mathematical probability to take the grand championship title. At the end, JJ Wang of Team HPI-A was crowned the Grand Champion with AI Luo of Team RW Lotus coming in second, and Dom Xu of Team JW-FGX finishing the season in third. SGP1 will be hosting Japan’s F1RCGP teams next month in Shanghai to kick off SGP1 season two, which will see all teams powered by Dualsky as the league’s main sponsor. AI Luo who won the first 3 rounds going into the deciding final round was 12 points behind JJ Wang who won round 4&5. JJ needed to finish top 6 in the A-Main to secure the championship. Dom Xu of JW-FGX’s only outside chance for the title was to win round 6 with AI and JJ not scoring any points at all. All 3 drivers qualified into the A-Main with TQ JJ being the only driver to set a lap time under 15 seconds. In the A-Main, JJ was head of the pack until a back-marker caused him to drop down in the pack with front wing damage. While AI, who was running mid field pretty much through out the finals DNF with 4 minutes left as he ran out of battery. With AI out of the race, JJ kept his position in check running second until the end of race to win the season Championship. Over 78 drivers representing 27 teams signed up for season one with an average of over 40 drivers and 15 teams at every race. SGP1 organizers formed the league to promote F1 RC racing and referenced other more established leagues such as Japan’s F1RCGP and US’s UF1 to set regulations. For season two, the SGP1 will be powered by controlled motor and esc from Dualsky, the official SGP1 sponsor.